Www.planet.com.tw IPX-300 Series PBX with FXO GW Configuration Internet Telephony PBX System Copyright © PLANET Technology Corporation. All rights reserved. 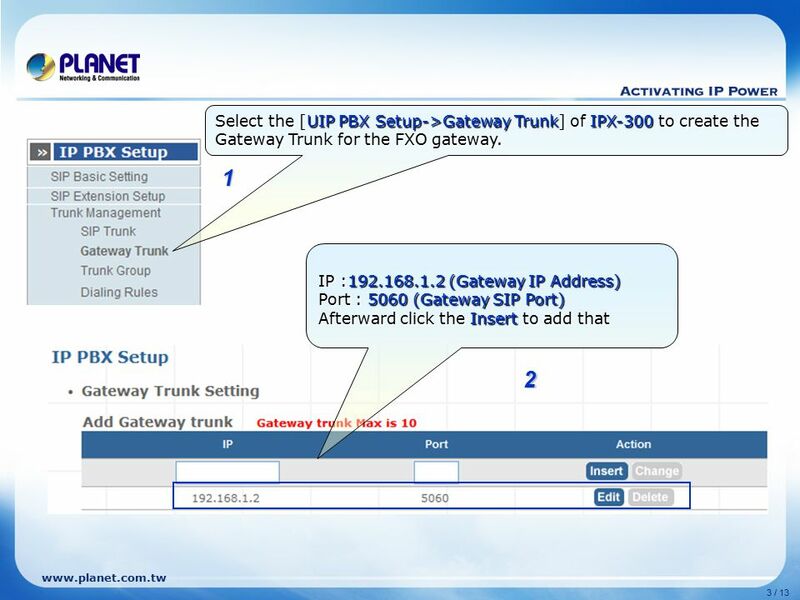 2 www.planet.com.tw 2 / 13 Case 22: IP PBX-Trunk-Gateway one-stage to dial Configuration We're using the IPX-300 and VIP-281FO to perform the calling party. Please refer to the following descriptions and insert proper parameters configurations into the each device for establish the voice communications. 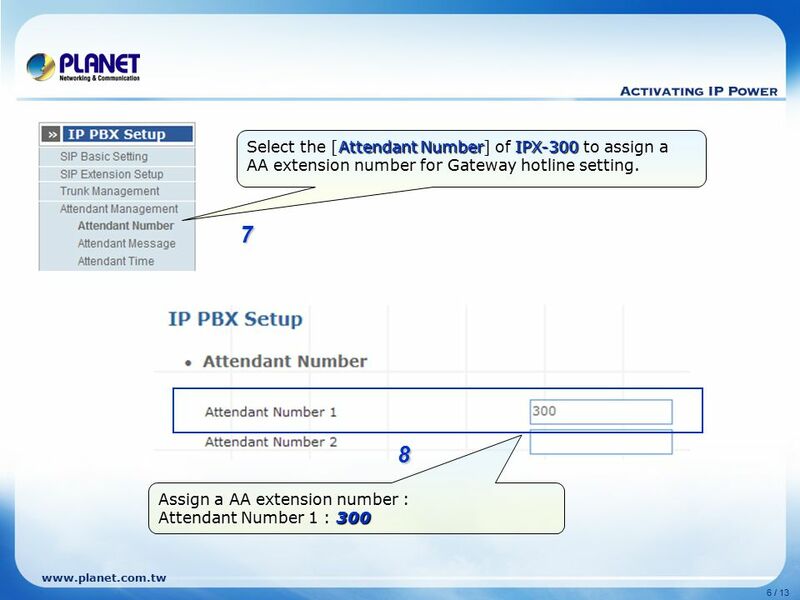 6 www.planet.com.tw 6 / 13 Assign a AA extension number : Attendant Number 1 : 300 7 8 Select the [Attendant Number] of IPX-300 to assign a AA extension number for Gateway hotline setting. 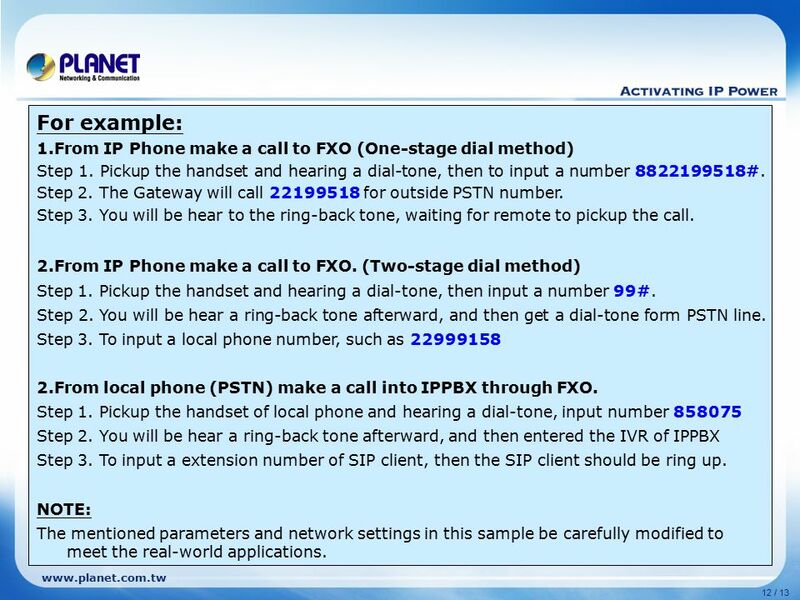 12 www.planet.com.tw 12 / 13 For example: 1.From IP Phone make a call to FXO (One-stage dial method) Step 1. Pickup the handset and hearing a dial-tone, then to input a number 8822199518#. Step 2. 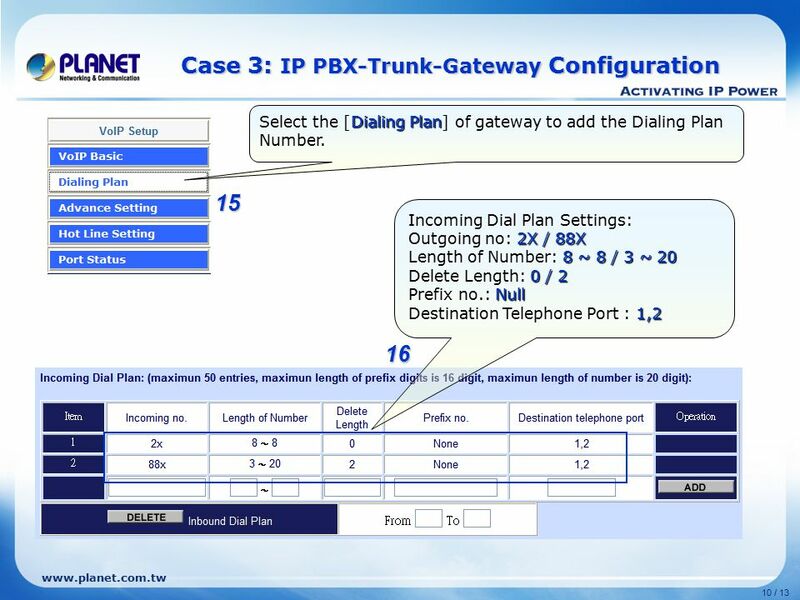 The Gateway will call 22199518 for outside PSTN number. Step 3. You will be hear to the ring-back tone, waiting for remote to pickup the call. 2.From IP Phone make a call to FXO. (Two-stage dial method) Step 1. Pickup the handset and hearing a dial-tone, then input a number 99#. Step 2. You will be hear a ring-back tone afterward, and then get a dial-tone form PSTN line. Step 3. 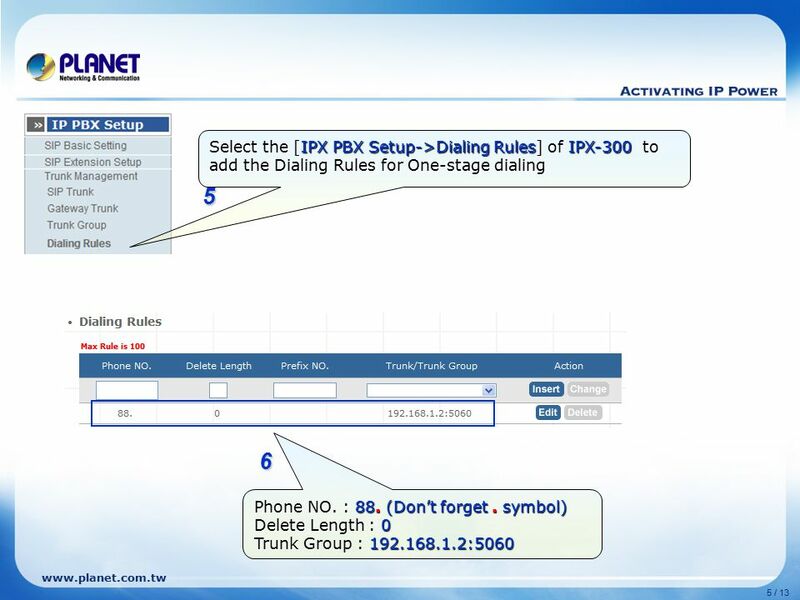 To input a local phone number, such as 22999158 2.From local phone (PSTN) make a call into IPPBX through FXO. Step 1. Pickup the handset of local phone and hearing a dial-tone, input number 858075 Step 2. You will be hear a ring-back tone afterward, and then entered the IVR of IPPBX Step 3. 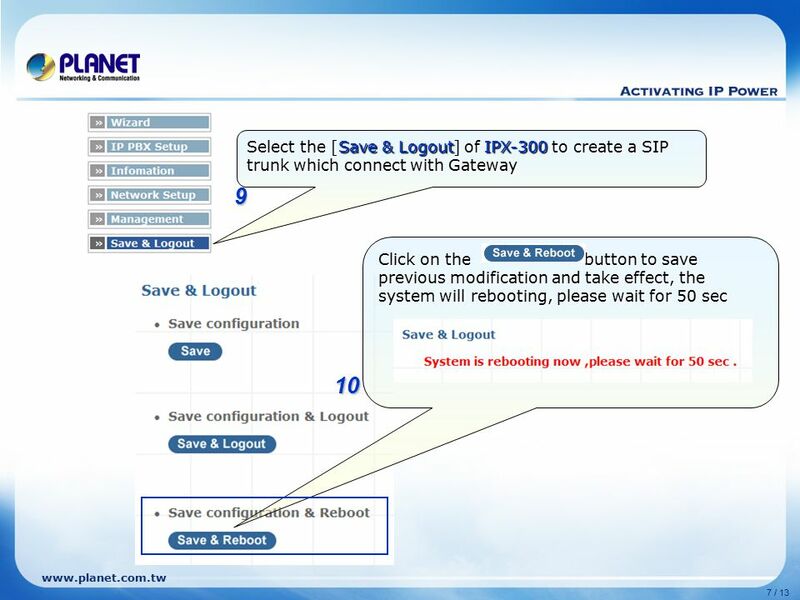 To input a extension number of SIP client, then the SIP client should be ring up. NOTE: The mentioned parameters and network settings in this sample be carefully modified to meet the real-world applications. 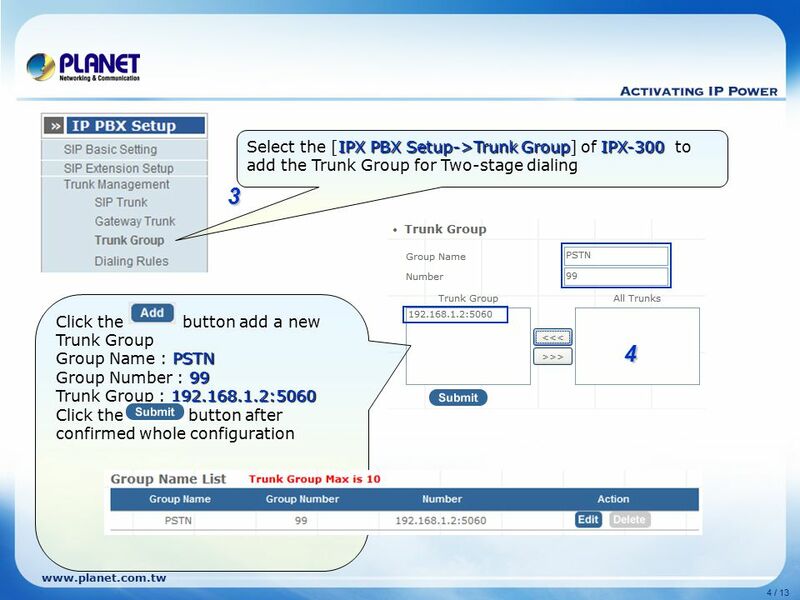 Download ppt "Www.planet.com.tw IPX-300 Series PBX with FXO GW Configuration Internet Telephony PBX System Copyright © PLANET Technology Corporation. All rights reserved." H.264 Series Camera Object Detection with NAS server Configuration IP Surveillance Internet Camera Copyright © PLANET Technology Corporation. Application Guide For Mesh AP – MAP-3120 How to setup the Mesh APs for Central Management? How to start up the Management Software for. ATA-150 / ATA-150S SIP Analog Telephone Adapter Copyright © PLANET Technology Corporation. All rights reserved. 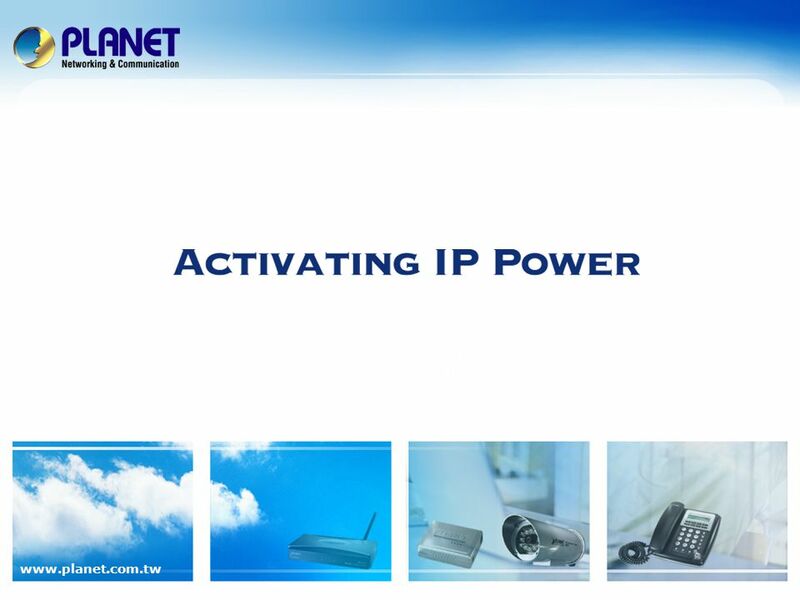 SG2001_VIP.ppt Page 1 PLANET Technology Corp. 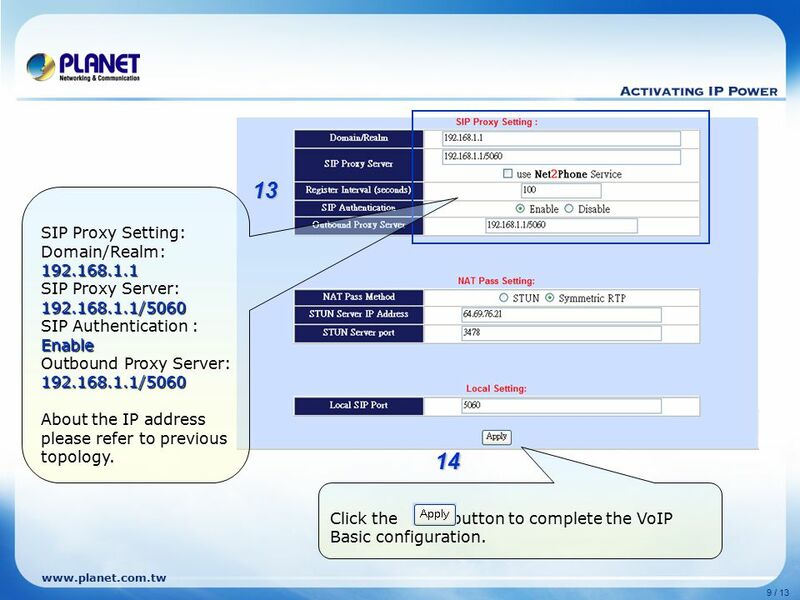 Product Guide 2001 VoIP Products Your Voice over Internet By Product Department. 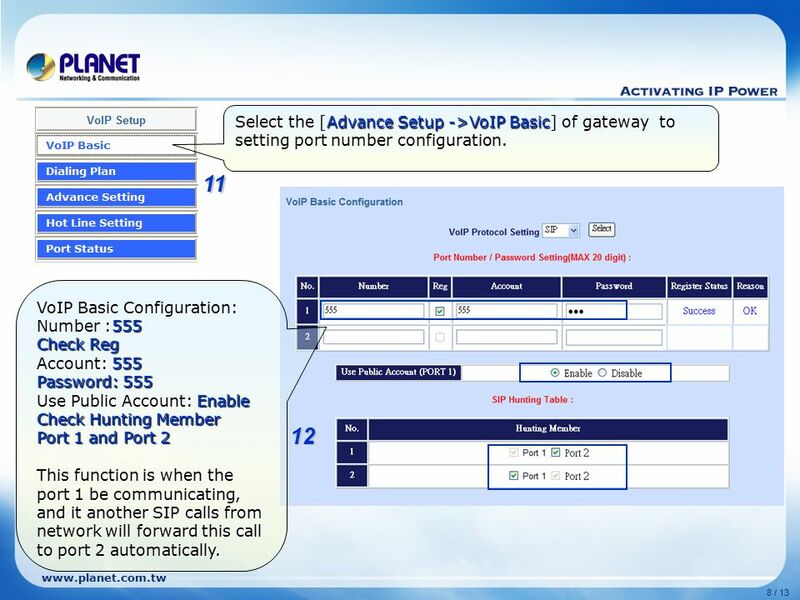 FAQ-Case20 3-Way Conference Configuration for ICF-1600, VIP-155PT, and VIP-321 in P2P mode VoIP SIP Phone Copyright © PLANET Technology. Business Enabled Communications Station Features. 1 / 62 Internet Telephony PBX System IPX-2000(V2) SOP for the Stackable Management. 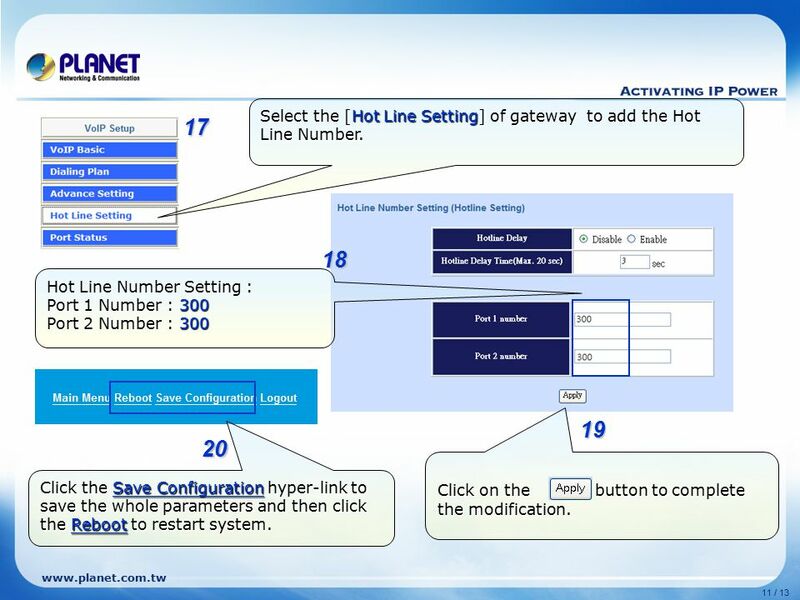 GSM Gateway VIP-281GS and ATA P2P Configuration Internet Telephony PBX System Copyright © PLANET Technology Corporation. All rights reserved. 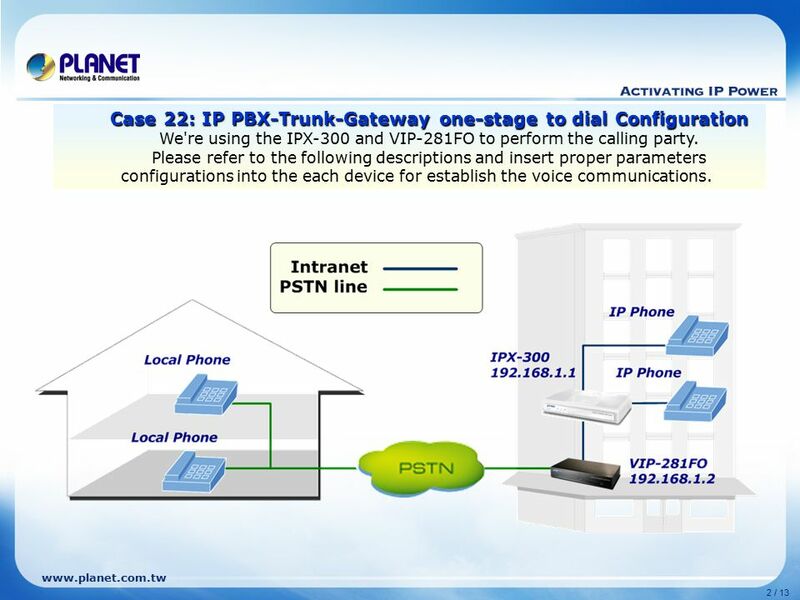 IPX-600 IP PBX with Gateway Configuration Internet Telephony PBX System Copyright © PLANET Technology Corporation. All rights reserved. 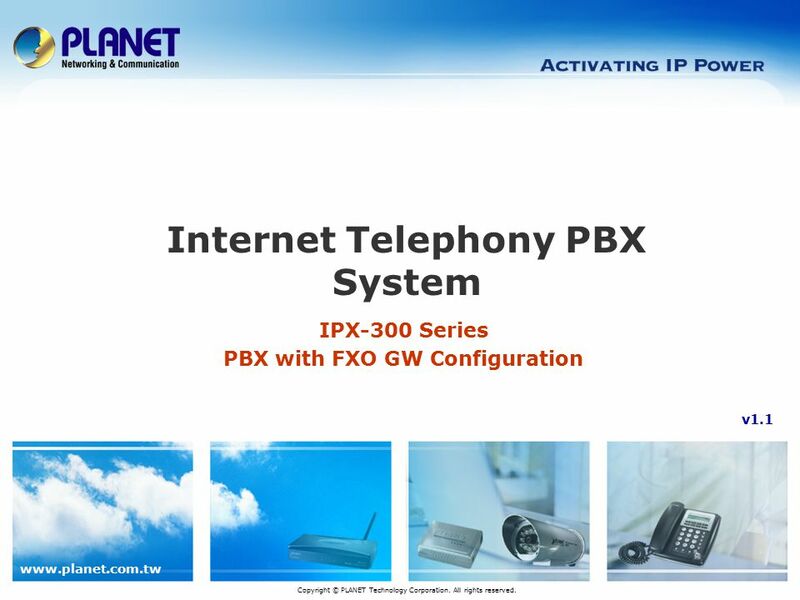 IPX-1980 Internet Telephony PBX System Copyright © PLANET Technology Corporation. All rights reserved. User Tutorial Press the Up & Down Arrow keys, or Left Mouse Click to progress through Tutorial. CommLink® Lite for Outlook® and Stand-Alone Version © Copyright.